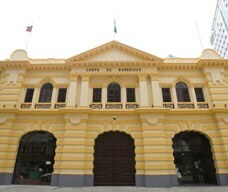 The Fire Services Museum Building was built in 1920 in European style, with more than 700 exhibits in two halls occupying an area of 350 square meters. 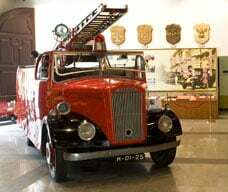 In the main hall there are Chinese and British made pumps, old British fire engines, a display showing a fireman sliding down a pole, data, historic pictures and shield, flags, diplomas, medals and badges of the brigade. There is also a mannequin dressed in a 1940's ceremonial uniform. 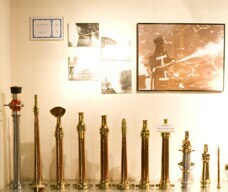 The second hall shows a more face of the brigade where there are a model of the Central Operational Post, an electronic board indicating the sites of current and past fire stations, a helmet and boots, traditional Chinese hoses and nozzles, ancient fire alarms, the plaque with the word well ladders, the breathing apparatus and public fire hydrants. There is also a model simulating the effect of fire on a wooden hut. Opening hours: Everyday from 10 a.m. to 6 p.m., open on public holidays.